Have a special treat for you today » my Nuclear Grade Stew recipe (2 pages). I've made this stew at least 50 times over the years .. probably closer to a hundred. Now that autumn is here, and the nights are getting chilly, it's time to break out the crock pot. For the pages that contain this recipe, I designed a new, single-sidebar layout .. another liquid-elastic hybrid. See what you think. For previous web pages, I used a design that comprised dual-sidebars, one on each side, cuz I liked the balanced, symmetric look provided by that layout. So this feature took longer to complete than expected, cuz I first had to code the CSS from scratch. I've made this stew for the Bug many times (cutting the veggies into smaller pieces so they fit easily in his little mouth). So it's made with lots of love. He digs it. Been lagging on entries lately, as you mighta noticed. Been dabbling in Programming. Kinda got lost. Big subject. On the personal side, I took the Bug kayaking last week .. out on the Newport Back Bay. (No waves there.) He later confided, "Dad, at first I was a little scared. But now I'm not scared." We stopped at a small island where he got out and searched for buried treasure. 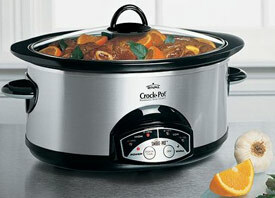 Continue reading Rad's Nuclear Grade Crock Pot Stew.